Hey, folks! 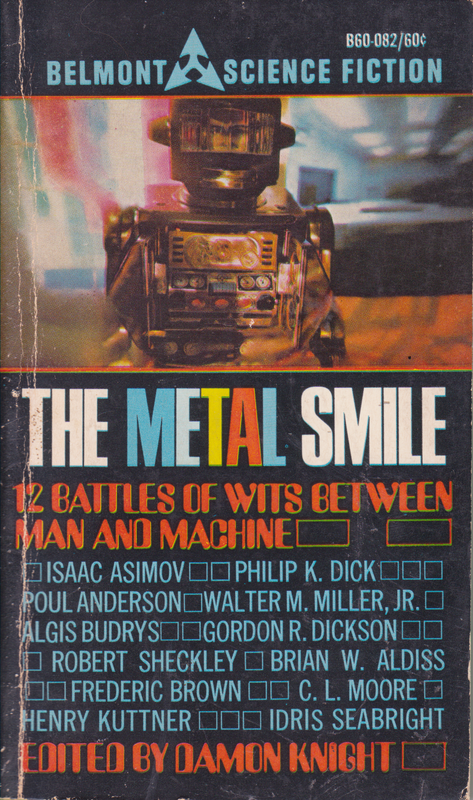 I’ve got another busy weekend so I figured it was time to review another short story from this nice little collection about robots. This was another good one! First, though, I figured I’d give a little rundown of the other stuff I’ve been reading, just because I can. I’ve been on a real nonfiction kick lately, at least for stuff I’m not reviewing. As a result of that, I’ve been enjoying Leo Rosten’s The Joys of Yinglish for the umpteenth time. Why do I love Yiddish so much? I don’t know if there’s a real answer to that, other than I just find it a very aesthetically pleasing language. I still read fiction for the fun of it, though, and my most recent reads on that front have been quite enjoyable. First up, there’s Sarah Gailey’s River of Teeth, a book whose premise had me hooked from the start. The basic gist of it is that it’s an alt-history western that takes place in the swamps of Louisiana and features a very large amount of feral hippos. It’s loosely based on one of the weirder bits of American history, covered here expertly by The Dollop. I haven’t finished it yet, but it’s promising so far. Seriously. Get it and read it. It’s some great, humanistic, hard science fiction dealing with political and business intrigues along with the mechanics of setting up a human colony on another world. There’s a lot of good human drama, characters I’m fond of learning about and seeing develop, and some good old-fashioned well-researched thinking about the practicalities of big important stuff. It’s basically got all the things I liked best about Jandrax and A Fond Farewell to Dying, all distilled into a neat 336-page package. I simply can’t recommend it enough. Anyway, I came here to talk about this Robert Sheckley short story. I’m ashamed to say this is my first entry into the Sheckley canon, prolific and notable as he is. I say I’m ashamed because, well, this story was very good. This is the third story from this collection that I’ve read, and while they’ve all been good, I think this is my favorite so far. It’s also the longest one up to this point. I’m not sure if that has anything to do with it. I think it does. The story has a good core of an idea to it that’s explored pretty in-depth, as opposed to a story that’s a setup and a punchline. There’s nothing wrong with that kind of story, mind you, but I enjoyed this one because it had some meat on them bones. The story is, like the rest of them in this collection, about computers. Specifically it’s about AI, and even more specifically it deals with the ways that AI can’t replicate all the things that humans do. That’s a theme that’s been dealt with a great many times before in fiction, but “Fool’s Mate” plays with the idea in a way that I really appreciated. Lots of stories about how humans can keep an edge on AI tell us that there’s something special and positive about humanity that computers can’t do themselves. Usually it’s something like imagination, or courage, or creativity, or our core human ideals, or our will to learn and explore, or any number of other things you’ll hear a Starfleet captain gush about. That’s all well and good. I like a story that talks about how humans can be great as much as the next guy. Heaven knows I need to be reminded that there’s something worth saving about this species every once in a while. Sheckley’s story turns it on its head, though, and manages to do it in a way that’s more than just a lol. The situation is that there’s a war going on. The sides in question aren’t delved into in any great detail. I didn’t figure out if humans were fighting other humans or if they were fighting some kind of aliens. It may be that I missed a line of dialogue somewhere, but the upshot is that it really doesn’t matter. Our fleet and their fleet have been farting around with each other for almost a year without any major engagements. We learn about this from the point of view of a fella named Richard Ellsner, who has been sent by the president to figure out why this extremely expensive war hasn’t actually done much of anything up to this point. The reason, he learns, is because of AI. The words Artificial Intelligence aren’t used in this story from 1953, but that’s the gist of it. They’re computers, and more specifically they’re called CPCs, Configuration-Probability-Calculators. In brief, they’re extremely skilled chess-playing devices. In a game of chess between two very and equally skilled players, the entire match can come down to the first several moves, after which it’s all about playing it out to the conclusion. Both players know the perfect move to react to the other player’s perfect move, and the point of the thing is finding out which player accidentally makes a sub-optimal move first. At least, this is what the book tells me. I’m awful at chess. This theory is expanded by the CPCs into the entire war itself. While our side has the advantage of numbers, the computers tell our folks that any attempt to attack will mean defeat. That’s just how it is. Sorry. The hell of it is, the predictions say that whichever side attacks first will lose. The enemy is working with this same information. Thus we have both fleets flying around each other never making any headway in getting this thing done. It also says that the entire rest of the war was decided based on the formation of our ships when they took off. What this means is that the crew has started to go crazy with the pressure. Whichever side makes the first mistake will be the loser, and so our forces are kept on high alert constantly. We learn this mainly through the character of Lieutenant Nielson, one of many crewmembers who has started to crack. After hearing this setup, Ellsner has a brilliant idea of how to win the war, and locks the captains and admirals off the bridge while he enacts it. Sure enough, while they’re pounding on the door demanding to be let in, Ellsner wins the frickin’ thing, and then he tells us how. He basically wins the war in the same way I win chess games. You know how I said I hate chess? Well, the only way I can actually play it is to play without any kind of strategy, just making moves as they occur to me. This drives real chess players insane and sometimes that means I win. Other times it means I have a bishop shoved up my nose, but I’m willing to take that risk if you buy me a soda. Ellsner figures that the one thing that the computers can’t compensate for is no strategy at all. The people in charge of the war argue that even randomness can be accounted for and planned against, so how did he solve for that? Well, he put the crazy lieutenant in charge. And there you have it! It turns out that the most useful human quality for defeating a computer is our ability to go gibberingly insane. More specifically and less flippantly, it’s our ability to be irrational. Lieutenant Nielson isn’t acting randomly, he’s acting in a way that makes perfect sense to him. And only him. And I guess that’s why I enjoyed this story so much. It’s one of those where it rephrases a human weakness into a human strength. Of course, that same human weakness is largely responsible for most of the problems we’ve faced over the last 200,000 years or so, but dammit, when it comes to taking on a robot, we’ll be ready. Our greatest flaw will lead to the triumph of neurons over silicon. It’s likely that same greatest flaw is what set the silicon against the neurons in the first place, I guess. Dammit, I’m talking myself out of liking this kind of story. Wait, no, I’ve got a save. The real point to this story and ones like it is thus: Stuff’s really complicated. Sorry. The point is that everything we humans can do is a double-edged sword. This is the deep meaning. Thinking irrationally is what gets us into wars, causes us to enslave our fellow humans over matters of melanin concentration, deny educational opportunities to our own children just so they won’t compete with us financially, and so forth. It gets us into a lot of trouble. But it also leads us to such irrational behaviors as creating stuff just for the fun of it. Rationality would tell us that writing a novel is a waste of time that could be better spent, I dunno, turning engine lathes or whatever, but it’s the irrational part of us that defies that, and it’s also the irrational part of us that is enriched by the act, whether we’re the one creating or the one consuming. It’s logic and rationality that might say that the best course of action when meeting someone poverty-stricken is to say “Sorry, buddy, I got mine. These resources are limited, you know.” It’s irrationality that defies that. And yet, even deeper, it’s rationality that might, one day, find a way to distribute resources in a way that gets rid of poverty altogether! And even deeper than that, it’s irrationality that would cause us to use rationality to achieve that goal! I didn’t mean to get all philosophical, especially since, I’m sure, many other, deeper, thinkers have said what I just said since Socrates was nary a twinkle in the Athenian eye. But you know what? That’s what I love about short stories. A novel might get me to thinking about stuff, but rarely as keenly as a short story does. I’m one that can get bogged down in details and forget the bigger picture. I’ve resigned myself to that. It takes all kinds to make a world. What that means, though, is that if somebody needs to make a point that I can really grab hold of, a short story is the way to do it. And Robert Sheckley, you did it.